MPPSC SET Result 2019: The officials of the Madhya Pradesh Public Service Commission (MPPSC) had successfully conducted the Madhya Pradesh State Eligibility Test (MP SET) from 17th To 24th January 2019. And now they are planning to keep out the MP SET Results 2019 out in the February 2019. In the below sections of this page, we have given the complete details of the MPPSC Cut Off Marks based on category as well as the MP PSC Merit List 2019. For the sake of the aspirants, we have also given the steps to download the MP PSC Result 2019 and the direct link to check them online from the official site. To help the candidates at any moment, we have formatted all the details of the MPPSC Assistant Professor Result 2019 in the tabular form. So, before checking out the results, you need to get a glance over the table to get the data like the name of the organization, the name of the test, the held exam date with the results release date. Additionally, we have also attached the official site of the Madhya Pradesh Public Service Commission (MPPSC) clearly with the job location. So, you can also refer to the official site for any other information. Candidates who have attempted the test must check the current page to get the updated information. So, most probably in the month of February 2019, the officials of the Madhya Pradesh Public Service Commission (MPPSC) will release the mppsc.nic.in Assistant Professor Results 2019. Also, you can easily check the exact date of the results announcement from the official site of the organization. So, after the completion of the test, once keep on check this page or the official site. The minimum marks that a candidate should score in the Madhya Pradesh State Eligibility Test (MP SET) will be referred to as the MPPSC Cut Off Marks. And also, the officials of the Madhya Pradesh Public Service Commission will only allow the candidates for the further rounds who have the qualifying score. So, you can check the MPPSC Cut Off Marks 2019 from the official site itself. Furthermore, these cut off marks will be based on the performance of the students, the past year analysis and the previous year cut off. Soon after releasing the MP SET Result 2019, the officials of the Madhya Pradesh Public Service Commission (MPPSC) will also publish the MP PSC Merit List 2019 on their official site. And it contains the name of the candidates who got more marks in the conducted test. So, while checking the MP SET Results 2019, all you need to check the merit list also. Use your hall ticket name to access the merit list. Follow the below steps to download and also to check the MP SET Results 2019. Many of the candidates are facing issues while verifying the MP PSC Result 2019. So, keeping such candidates view in mind, we have furnished the direct instructions to obtain them online through the official site. At first, candidates need to move to the official site of the Madhya Pradesh Public Service Commission @ mppsc.nic.in. In that home page, click on the Results tab that appears to the left. Then, click on the direct link that refers to the MP SET Results 2019. After that, enter all the details like the Hall Ticket Number, Date Of Birth or Password to access the login page. Now, you can check your MPPSC SET Result 2019 on the screen. Download the results and then also keep it safe for further usage. 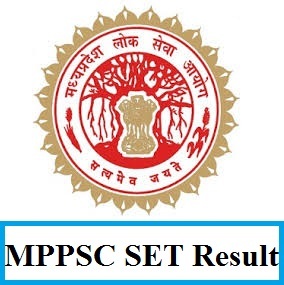 Got all the information about the MPPSC SET Result 2019? then, you can stay in touch with us only on our FreshersNow.Com page.